The figures are contained in reports released by the state's Education Department, which show more than 10 per cent of the state's schools reported at least one serious incident in the six months to September last year. The figures also show a drop of more than 15 per cent in the number of pupils expelled for misbehaviour, pointing to an increase in suspensions for problem pupils. The department says more than 13,000 long suspensions were handed out last year - a rise of more than 1,000 from the previous year. NSW Teachers Federation president Maree O'Halloran says programs such as special suspension centres are underfunded. "There's a very long waiting list for the special suspension centres," she said. "Secondly, there's a general issue of professional development of teachers for behaviour management - putting money into developing the skills of teachers. That's something the department is not doing enough of." A report in today's Daily Telegraph says instances of drug use, bullying and teacher assaults are not being recorded after changes to the reporting procedure. A spokesman for the Education Department has denied it is covering up the full extent of crime in the state's schools. He says changes have been made to record each incident with more accuracy and denies any censorship is taking place. But Ms O'Halloran says the department is sifting through the information and reporting fewer incidents. "I think the number of instances where there have been an issue in school about safety may be greater," she said. "What the department collects now is the very serious instances. There is probably some low-level disruption that still causes distress that's no longer reported." 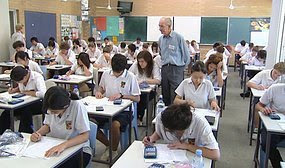 However, NSW Education Minister John Della Bosca says the figures released by the Education Department show more resources and greater authority given to school principals are working. "They're making sure that schools are becoming safer and safer places, and that teaching and learning is happening in schools and disruption is minimised," he said. Mr Della Bosca says schools remain among the safest places in the community and students are responding to disciplinary measures. "It sends a strong message both to the student, the school and to the family that community standards and expectations need to be met," he said. "What we're finding is 88 per cent of students who are sent to a suspension centre or a behaviour school learn their lessons, improve their behaviour and don't need to return."